Tons of area lots within 5 min walk. 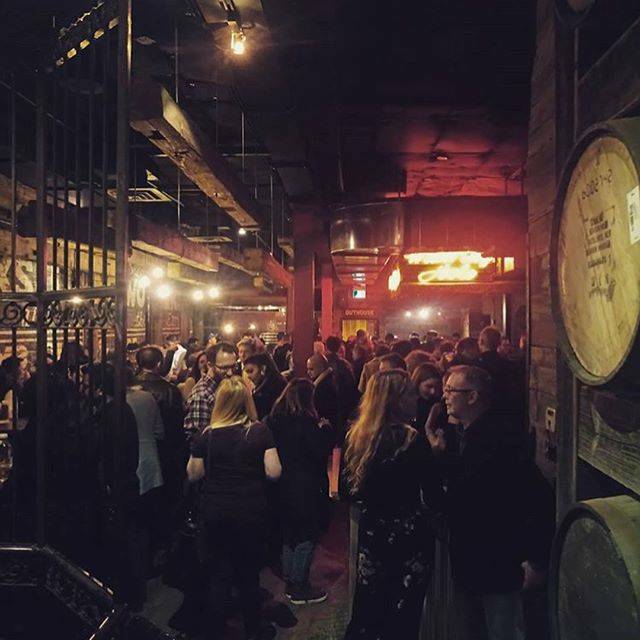 Live bands in The Joint Friday & Saturday nights. Food Truck to full weddings. Groups from 20 to 200. 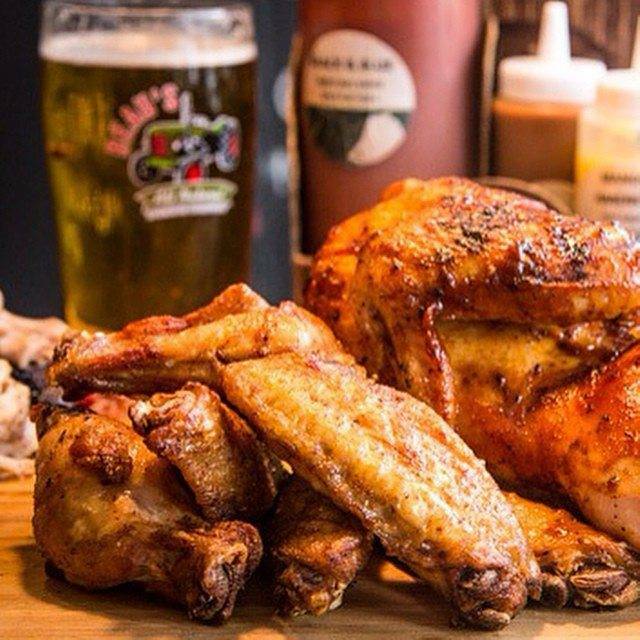 Southern-style barbecue dripping with flavour rules at this downtown smoke house, the standstill evolution of its wildly popular barbecue-on-wheels and beaches predecessor. 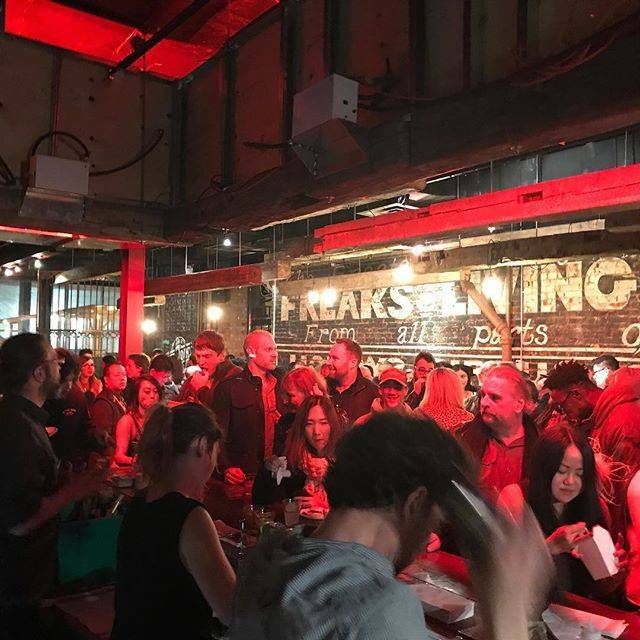 Here, Pit Master Scott ' Hogfather' Fraser & Executive Chef Sean Simons take enthusiastic customers on a ride through the expansive wonders of smoking, grilling and saucing with stops along the way at pulled pork, brisket and baby back ribs meaty enough to shame a caveman. The addition if a custom built wood fire grill behind glass expands their famous menu to include steaks, seafood and fish. Everything is cooked a long time here, but your patience pays off in spades. Guests dig in with both hands, their collection of spent napkins growing in direct relation to their enjoyment of the meal. The restaurant has great variety of food choices and a very simple environment. The service was helpful, informative and quick. The place was disappointing for my first visit. 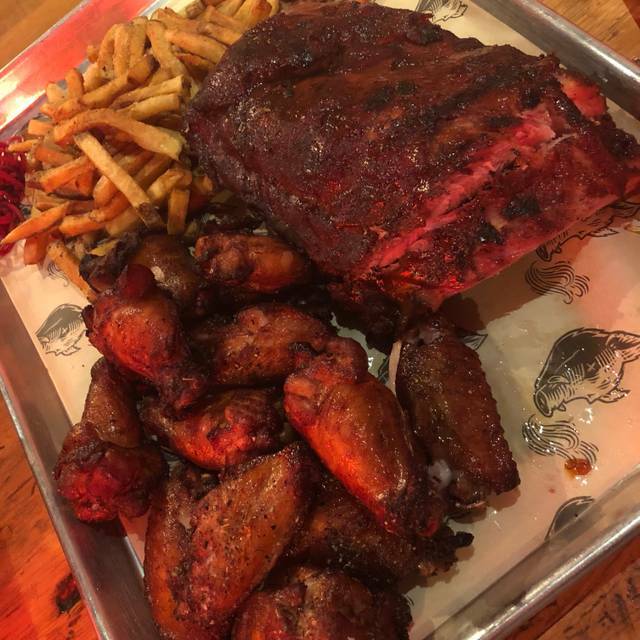 I didn’t find my ribs very tasty - it appears you need to use a lot of sauce to add flavour to the food. Service was slow at times and overall food prices are high for the food quality. Best BBQ I’ve eaten in a very long time. Full stop! The food was great. ambience strived hard to reflect informal downhome fun. would love better sharing platters. The three of us were not enough to order a wide selection from their grill offer. What a wonderful night! Our server was friendly and attentive. The food was EXCELLENT. We will certainly be back! 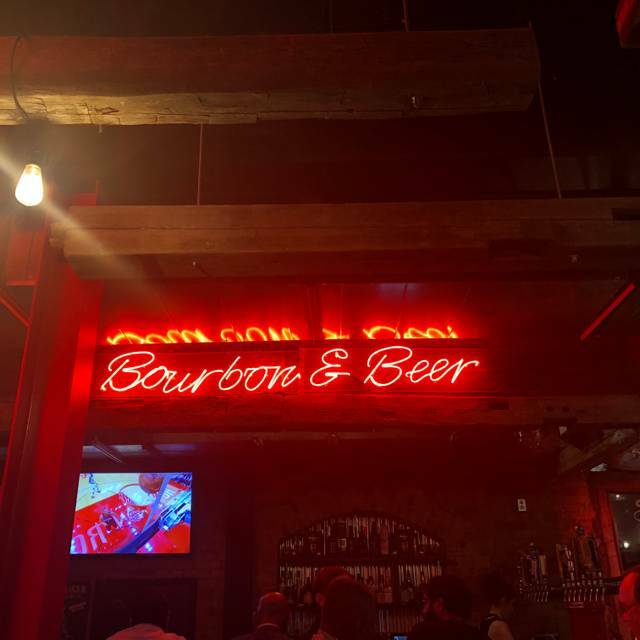 Outstanding food, great service, good background music and great overall "BBQ" atmosphere. Excellent and creative menu with broad choices for all sizes of appetite. Looking forward to my next visit! Dinner out with husband, father in law and teen daughter. Arrived to a nearly empty restaurant and was seated jammed between the only 2 other tables with people in the whole restaurant. Asked if we could move and was told to wait for hostess and then after staff conferred for 10 minutes on this we got to move back one row. After another 10 minutes we had to flag the bartender to send our waitress over. She had been standing at the end of the bar chatting with some guys sitting at the bar and not paying attention to us. Once we ordered everything was fine and she was attentive after the bumpy start. Had burnt ends, ribs, sausage, brisket, pulled pork poutine and fish tacos between all of us. Food was great. No complaints there. When we left the restaurant was still pretty empty so not sure why it was such a big deal to move tables. Other complaint my husband had is that their chalkboard sign on the entry steps is a SteamWhistle beer sign but as he found out they don’t serve SteamWhistle- suggest they ask for a new sign from a beer rep of one of the beers they do sell. Chicken and waffles were AMAZING. 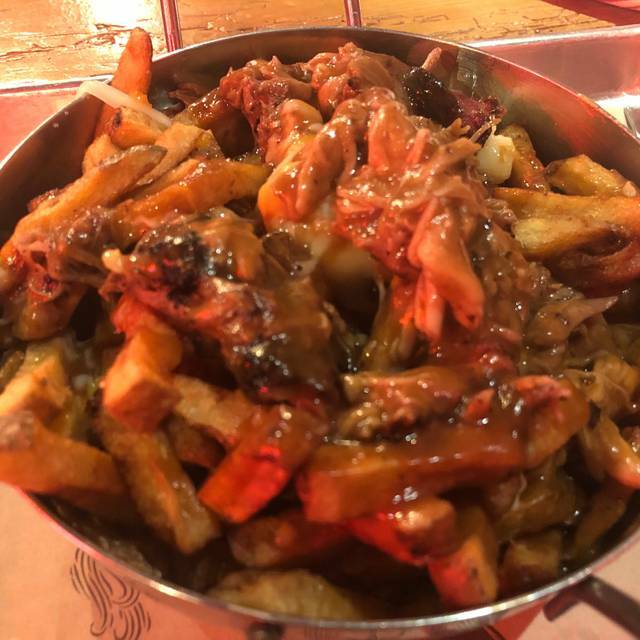 Ribs were okay, poutine was disappointing. Asked for BBQ sauce before food arrived but they said they had a bottle shortage and we did not get it until we were almost done with our food. Decor was cute- tables were a bit too small! Would recommend for bar and eats or to try the chicken and waffles alone, but other dishes were par for the course. Great food and great services. Will definitely go back. Outstanding brisket, both as a platter and the “burnt ends”. Also ordered back ribs but did not enjoy that as much. I found it had a bit of a licorice type taste which was not what I was expecting at all. They need another server or 2. Our server seemed to be the only one so it took a while to get drinks. They had others help to bring out the food. Would definitely go back for the brisket though. It was soooo good. Great comfort food, don't leave without having/sharing a peanut butter pie... You won't regret it. Best beef brisket too! 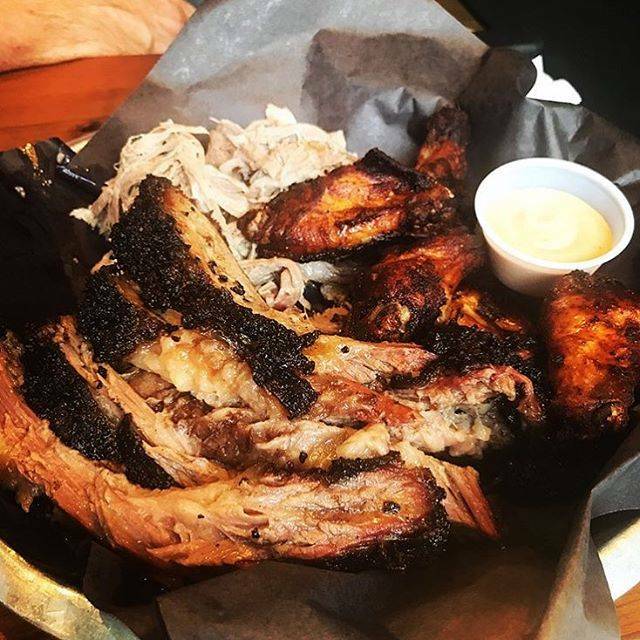 I took my friend to Hogtown Smoke for her birthday. We had a really nice time, good food and good value and very nice atmosphere. I will recommend it and we will return. Both the food and service were very good, but it was pretty pricey. Be prepared to $20 for a sandwich and fries. The food was not very hood. I guess good food is ecpensive and this restaurant is not. Food was not great. Beans had a horrible taste. Ribs so-so. Sandwiches average. Nothing special. Server horrible. Don’t know if she was over-extended, but didn’t check on our table more than ono. Had to keep waiting to get her attention. We had to wait 20 min for a beverage refill. Sat there 15 min after everyone was done, waiting to get her attention to get the bill. Great location and atmosphere. The root fries were great too. Poor food. Waiter forgot our order. Overpriced. Overall a bad dining experience. Great ribs and brisket. Can be loud, especially when they're showing a game. Service and food was great! I honestly think it was the best ribs I’ve ever had! Service was great but i can’t say the same for the food. I enjoyed the food and atmosphere, however the price was a bit more than I initially assumed it would be, especially since we got a platter. Overall, would recommend and come again to try more food! I went here for Valentine’s Day. Reservations were super easy and easy to change if needed! Food was amazzzzing and the staff were all very nice! Definitely looking forward to going back again! The BBQ was AWESOME!!! We had a group of 8 and we ended up doing family style which was definitely the way to go. Everything on point right from start to finish. Sat at bar, had some drinks and pulled pork grilled cheese. Birthday party for a colleague. We had a good time because we have a good group but it wasn’t the greatest experience. The bathrooms, which are ironically labelled “outhouse”, actually smelled like a real life outhouse. This smell, which I later figured was coming from the smoker, was infused in the brisket I had. The brisket was also very dry. Our server wasn’t very friendly and seemed annoyed by us, but we were a louder group and a little rowdy so I wouldn’t put too much weight on that. Ultimately the food was the biggest turn off. I was disappointed as the experience is nothing to brag about. It’s not cheap and at the same time nothing special. Great food and service. Fun to order enough for sharing so you can taste more variety. Best Smoked Meat in TO. Ribs are moist and well done. Start with the kitchen sink. Great food and love the decor!! If you want some great smoked meat this is the place in Toronto. 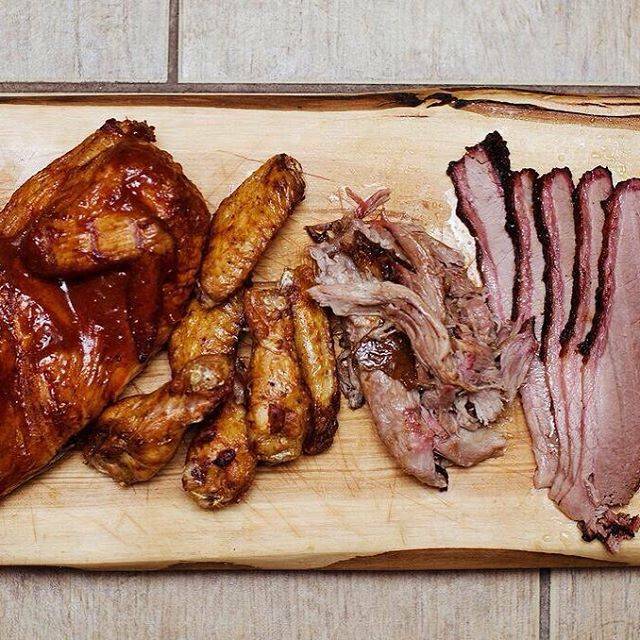 Authentic smokehouse fare in an urban century space. Loved the beef rib- worth the trip just for this! And we grabbed a couple of their Andouille sausages to go which were spicy and not greasy. Brisket was great too. Oh yeah, they do duck fat fries- nuff said. Cool space downstairs but I have put caught a band there yet. Makes me think of the Beatles in the Cavern club. I hear they rent it out for private events. In the winter the restaurant is a bit Cold. Hoping it would be a bit warmer. 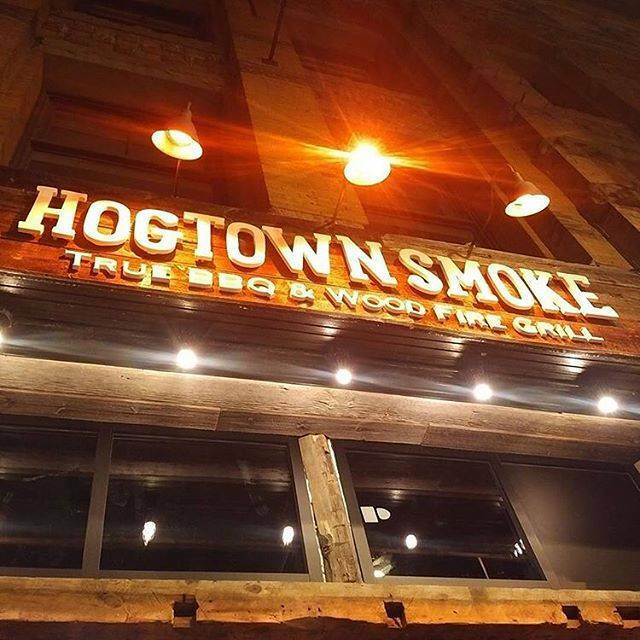 See Full Restaurant ListMake a reservation at Hogtown Smoke on Colborne St.